Doctor Who is back and it’s a new Doctor! JC, Rita and Dr. Scott along with special guest, NY Times Best Selling Author Debbie Viguie discuss Jodie Whittaker’s first episode as the Doctor, the new companions and the changes to the show! Is it better? Is it worse? We tell you what we think! The post Transmissions From Gallifrey – Episode 1 – S11.E1 The Woman Who Fell To Earth appeared first on Transmissions From Atlantis. JC and Rita sign off for the final time on Transmissions From Atlantis. It’s been a long ride and this epic final podcast takes you back over 147 episodes and gives you some of the best moments as well as some epic interviews with Star Trek’s Garrett Wang, MST3k’s Joel Hodgson, and best selling author Hugh Howey. In addition, we preview the future of the Transmissions From Atlantis Entertainment Network. It’s a long one, but you’re not going to want to miss a moment! The post Episode 148 – It’s the End, But the Moment Has Been Prepared For appeared first on Transmissions From Atlantis. Episode 147 - It's Not the End, It's DragonCon 2018! We said this one would be the last. We lied. JC and Rita give you a surprise look into DragonCon 2018, including their favorite cosplay, celebrity moments and more. Plus they talk about the Doctor Who day change and give you audio from Peter Capaldi and Peal Mackie’s panel at DragonCon. Join us for another trip around the ‘verse! Transmissions From Atlantis 147 – It’s Not The End, It’s DragonCon 2018! The post Episode 147 – It’s Not the End, It’s DragonCon 2018! appeared first on Transmissions From Atlantis. JC and Rita give you their annual preview of the premiere pop culture convention, Dragon Con, including an interview with the dynamic duo of the American Sci-Fi Classics track, Joe Crowe, and Gary Mitchell. In addition, they review the Jason Statham blockbuster the Meg, season 7 of Voltron and give you the latest on Doctor Who. The post Episode 146 – Dragon Con 2018 Preview appeared first on Transmissions From Atlantis. JC and Rita are back. In this jam-packed episode, we give you the lowdown on the Seekers of the Lost Worlds Premiere event, we wrap up our MCU re-watch and in Rapid Fire, provide a bevy of film reviews. Of course, we talk San Diego Comic-Con and all the Doctor Who news, plus a very important announcement you will not want to miss! All this and more on Transmissions From Atlantis! 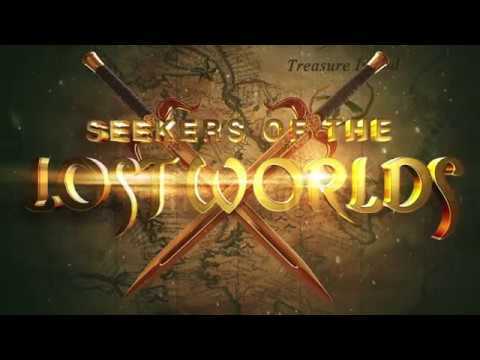 Seekers of the Lost Worlds – The Premiere from Brazen Wench Productions on Vimeo. The MCU Rewatch is complete. The post Episode 145 – MCU Re-Watch, Seekers Premiere, SDCC Doctor Who and a Big Announcement appeared first on Transmissions From Atlantis. JC and Rita are back with a new sound and a jam-packed podcast! First, we catch up on the two biggest films of the summer, Deadpool 2 and Solo – A Star Wars Story. Then we give you the low down on our newest geeky project, re-watching the MCU in chronological order. In Doctor Who – there are MAJOR Season 11 rumors including the return of a fan favorite! All this and more on TFA 144! When are we getting the next trailer? Return of a few favoriters? Find out more at the Digger Bar! The post Episode 144 – Deadpool 2, Solo: A Star Wars Story, and the MCU appeared first on Transmissions From Atlantis. JC and Rita are live from the premiere Atlanta Doctor Who convention Wholanta 2018! We’ll have interviews with multiple guests (including a major announcement from New York Times Best Selling author Debbie Viguie and ESO Network’s Mike Faber), review the con and give you some of the sights and sounds of Wholanta 2018. In addition, we offer you Avengers Infinity War grief counseling. Full warning – There WILL BE SPOILERS. All that and more on this installment of Transmissions From Atlantis. BTW – you can watch the entire Louise Jameson (Leela) panel from Wholanta 2018 on the ESO Patreon! 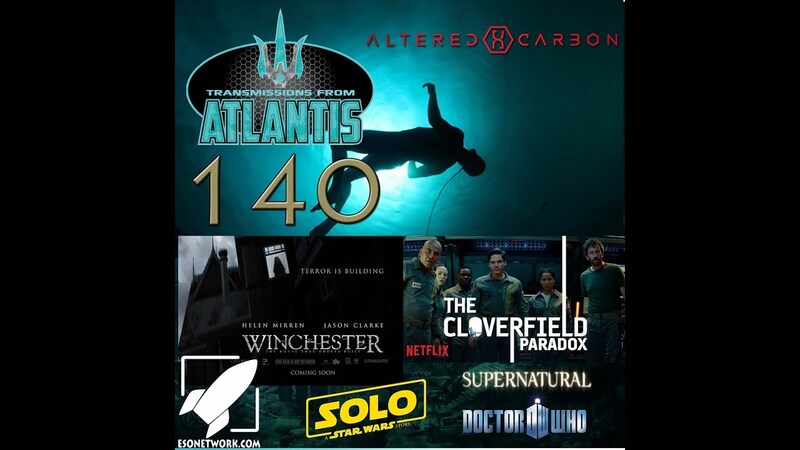 The post Episode 143 – Live from Wholanta 2018 and Avengers Infinity War Grief Counseling appeared first on Transmissions From Atlantis. In this month’s episode, JC and Rita give you a jam-packed show with a review of Ready Player One. Plus, the director of the upcoming Doctor Who convention in Atlanta, Wholanta, R. Alan Siler gives us a low down on what to expect at this year’s convention. Plus in Rapid Fire, we talk ScoobyNatural, Ripper Street, Star Wars and more! Black Panther has topped Titanic! Constantine is now a regular on Legends of Tomorrow! Spielberg says the Next Indiana Jones Could be a Woman! Meryl Streep might replace Carrie Fisher as LEIA? NOOO! Steven Moffat has included the Peter Cushing Doctor Who movies in canon! 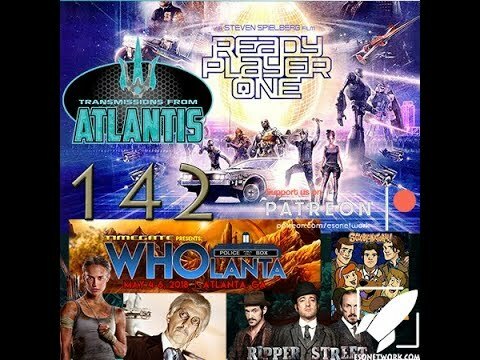 The post Episode 142 – Ready Player One and the Wholanta Preview appeared first on Transmissions From Atlantis. JC and Rita are fired up about Disney’s new remake of the classic novel A Wrinkle In Time. Plus the duo discusses Voltron, Jessica Jones, Star Wars, ScoobyNatural and of course, Doctor Who. 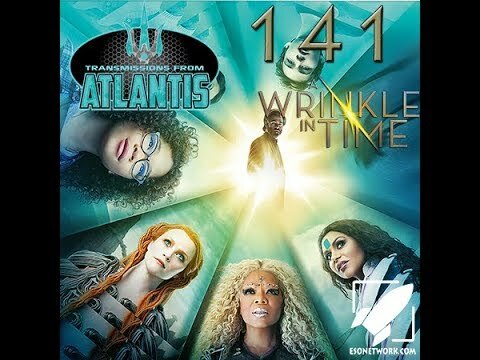 The post Episode 141 – A Wrinkle In Time appeared first on Transmissions From Atlantis. JC and Rita are back with a jam-packed episode of Transmissions From Atlantis. This week we talk Netflix’s Original Series Altered Carbon. Plus all of the Super Bowl movie trailers including Avengers Infinity War, Solo and Deadpool 2. Plus Doctor Who, the Black Panther Rotten Tomatoes controversy, The Winchester Film, Wayward Sisters, the Cloverfield Paradox and more! Is Doctor Who moving to Sunday? Georgia Tennant annoyed Jenny was never brought back. The post Episode 140 – Altered Carbon (and a bunch more) appeared first on Transmissions From Atlantis. JC and Rita get to the bottom of the Last Jedi controversy, review the Doctor Who Christmas Special and reflect on the Peter Capaldi, Steven Moffat and Murray Gold eras. Plus Lucifer, the Walking Dead, and More! Be sure to check out the video version of this podcast! The post Episode 139 – The Last Jedi and the Last of the Capaldi Era (Audio and Video Podcast) appeared first on Transmissions From Atlantis. JC and Rita are in the Christmas spirit and give you the low down on this Holiday season’s biggest films – Star Wars the Last Jedi, Downsizing and special sneak preview review of Jumanji – Welcome 2 the Jungle. Plus, they preview the Doctor Who Christmas Special. Could there be a surprise appearance? Who could be returning for the Christmas Special? The post Episode 138 – Jumanji and the Holiday Movie Season appeared first on Transmissions From Atlantis. JC and Rita are in the upside down and loving every minute of it. We talk Stranger Things 2, plus Thor Ragnarok and the 13th Doctor’s new look – revealed! All this and much more on Transmissions From The Upside Down…er Atlantis! The post Episode 137 – Stranger Things 2 appeared first on Transmissions From Atlantis. JC and Rita have a frightfully good time telling you about Supernatural, Stranger Things, the Walking Dead and their scariest Halloween stories. Plus, Doctor Who, Star Wars and more! Did Mark Hamil confirm Luke is a Villan? The post Episode 136 – Halloween 2017 appeared first on Transmissions From Atlantis. JC and Rita are back and we have some big Seekers of the Lost Worlds news! The movie’s soundtrack is complete and we give you a preview in this very episode. Plus we tackle Star Trek Orville vs. Star Trek Discovery (it’s not a typo). Also, Doctor Who, Lucifer, and the Original Blade Runner. All this and more on Transmissions From Atlantis! The post Episode 135 – Star Trek Orville vs Star Trek Discovery appeared first on Transmissions From Atlantis. JC and Rita have survived Hurricane Irma and are ready to deliver to you some awesome TFA Goodness including a complete review of DragonCon 2017, the Twin Peaks finale, meeting Doctor Who’s Matt Smith and Karen Gillan and so much more. The post Episode 134 – Hurricanes, Twin Peaks and Dragon Con 2017 appeared first on Transmissions From Atlantis. In a special Quick Blast, JC and Rita talk the season seven finale of Game of Thrones and the craziness of Twin Peaks. The post Quick Blast 06 – Game of Thrones Season Finale and Twin Peaks appeared first on Transmissions From Atlantis. It’s time – Dragon Con 2017 is upon us! Rita and JC give you interviews with the track directors for Military Sci-Fi, Urban Fantasy and Star Wars. In addition, we preview a huge lineup in Brit Track and let you know where you can find us! Note: Schedule subject to change…it’s DragonCon, anything can happen. Short-ish panel, then WE’RE WATCHING KRULL. Closing featuring The Hillywood Show‘s Supernatural Parody Shake It Off. The post Episode 133 – The One That is a Big Preview of DragonCon 2017 appeared first on Transmissions From Atlantis. JC and Rita are back with a review of the Stephen King film adaptation, The Dark Tower. Also, the duo interview Dragon Con American Sci-Fi Classics track director Joe Crowe and Science track director Dr. Stephen Granade, plus we cover Doctor Who, Twin Peaks, Game of Thrones and so much more! Bright – Will Smith, Elves Lord of the Rings Meets Alien Nation? Closing featuring Queen’s It’s a Kinda Magic. The post Episode 132 – The One About the Dark Tower and with DragonCon 2017 Interviews appeared first on Transmissions From Atlantis. JC and Rita are back with a jam packed episode! DragonCon Media Director Dan Carroll joins the dynamic duo to give us the latest on DragonCon. Plus we talk Valerian, War for the Planet of the Apes, Doctor Who, Stranger Things and so much more! Stargate Origins – new Stargate web series! The Doctor’s Daughter on Big Finish! Could Kris Marshall actually be the Doctor’s Companion? The post Episode 131 – The One About Valerian & War For the Planet of The Apes appeared first on Transmissions From Atlantis. Episode 130 - The 13th Doctor - Is the Future All Girl? In this week’s episode, JC, Rita and Doctor Scott talk about Jodie Whittaker becoming the 13th Doctor. What does it mean for Who and who will be joining her in the TARDIS? Plus, the Game of Thrones Premiere, Twin Peaks and More! Transmissions From Atlantis 130 – The 13th Doctor – Is the Future All Girl? Who will be the companion? The post Episode 130 – The 13th Doctor – Is the Future All Girl? appeared first on Transmissions From Atlantis. JC and Rita are back and we’re talking the blockbuster of the year, Spider-Man Homecoming. In our rapid fire segment, we give our thoughts on Despicable Me 3, the American Gods season finale and the Jumanji – Welcome to the Jungle trailer. In Doctor Who, Dr. Scott joins us to talk the Doctor Falls – Series 10’s Finale and preview the Christmas Episode. When will we know who will be the next Doctor? The post Episode 129 – Doctor Who Series 10 Finale and Spider-Man Homecoming appeared first on Transmissions From Atlantis. Episode 128 - What the Hell Just Happened In Twin Peaks & Doctor Who? In this expanded episode, JC & Rita bring in the Oncoming Storm‘s Rachel Stewart and Dr. Geeks Lab’s Dr. Scott Viguie to explain to us what the heck just happened in Twin Peaks and Doctor Who. Plus, we talk Han Solo, Spaceballs, Star Trek Discovery and more! Transmissions From Atlantis 128 – What the Hell Just Happened In Twin Peaks & Doctor Who? Han Solo Controversy – Director’s Fired, Disney not happy with Alden Enrenreich’s portrayal of Han. Main Topic – Twin Peaks – What the Heck? The post Episode 128 – What the Hell Just Happened In Twin Peaks & Doctor Who? appeared first on Transmissions From Atlantis. Episode 127 - Is the Mummy as Terrible as Everyone Says? JC and Rita tackle the Mummy – was it as terrible as everyone says it is? Plus, Doctor Who and the Eaters of Light. In Rapid Fire, we talk Carrie Fisher, the Supernatural spinoff, the Watchmen Reboot and more! Transmissions From Atlantis 127 – Is the Mummy as Terrible as Everyone says? The post Episode 127 – Is the Mummy as Terrible as Everyone Says? appeared first on Transmissions From Atlantis. JC and Rita talk about the wonder of Wonder Woman, plus Doctor Scott Viguie joins the duo to talk Doctor Who – The Lie of the Land and Empress From Mars! The post Episode 126 – Wonder Woman appeared first on Transmissions From Atlantis. JC and Rita celebrate the 5th anniversary of Transmissions From Atlantis with a jampacked lineup featuring their review of Pirates of the Caribbean 5 – Dead Men Tell No Tales. Plus in rapid fire, they talk Twin Peaks – The Return, American Gods, Lucifer and More. In Doctor Who, will Peter Capaldi regenerate in the next episode? Plus reviews of Extremis and Pyramid at the End of the World. All this and more in this special anniversary episode of Transmissions From Atlantis! Will Capaldi Regenerate next episode? Closing featuring He’s a Pirate techno remix from The Dead Men Tell No Tales OST. The post Episode 125 – The 5th Anniversary Episode feature Pirates of the Caribbean Dead Men Tell No Tales appeared first on Transmissions From Atlantis. JC and Rita are back from Atlanta’s premiere Doctor Who convention, Wholanta, with interviews with writer Jamie Mathieson (Mummy on the Orient Express and Oxygen) and actor Camille Corduri (Jackie Tyler). Plus they review Guardians of the Galaxy and THREE Doctor Who Episodes (Thin Ice, Knock Knock and Oxygen). The post Episode 124 – Wholanta 2017 and Guardians of the Galaxy Vol 2 appeared first on Transmissions From Atlantis. JC and Rita tackle Ghost in the Shell, anime vs. live action. They also interview R. Alan Siler Co-Director of the Doctor Who Convention WHOlanta. Plus, Doctor Who Season 10 Episode 2 – Smile and more rapid fire. WGA Strike which could delay Walking Dead and other shows. The post Episode 123 – WHOlanta Preview plus Ghost in the Shell appeared first on Transmissions From Atlantis. JC and Rita celebrate the return of two amazing shows, Doctor Who and Mystery Science Theater 3000. Also in Rapid Fire we talk The Last Jedi, Spider man Homecoming, Thor Ragnarok and remembering Prince. Listen to Episode 83 for the Joel Hodgson Interview. Listen to TFA presents Prince – A Remembrance for our remembrance of the Purple one. Our Rememberance of Prince shortly after his death. Listen to Episode 83 for the Interview we’re discussing. Kris Marshall is Doctor Who? The post Episode 122 – The Return of MST3k and Doctor Who appeared first on Transmissions From Atlantis. TFA returns as Rita gushes over the live action Beauty and the Beast – Plus – The Walking Dead Season Finale and will Peter Capaldi regenerate in Doctor Who BEFORE the Christmas Episode? All this and more on TFA 121! Bill a one season companion? Capaldi regenerates in season 10 finale? Phoebe Waller-Bridge is the new favorite to be the next doctor? The post Episode 121 – Beauty and the Beast plus the Season Finale of the Walking Dead appeared first on Transmissions From Atlantis. Episode 120 - Logan and is Kris Marshall the Next Doctor Who? A special live event – Transmissions From Atlantis was live on youtube for the very first time. In this episode, we’ll be talking the new X-Men film, Logan, along with Doctor Who – Is Kris Marshall the Next Doctor? That, plus the Walking Dead, Sleep Hollow, an interview with Seekers of the Lost Worlds Star Shanel Sparr and much more! Kris Marshall the next Doctor? The post Episode 120 – Logan and is Kris Marshall the Next Doctor Who? appeared first on Transmissions From Atlantis. We are back Ladies and Gents and not a moment too soon. There’s big news in the Whoniverse as Peter Capaldi is leaving Doctor Who. We talk about his departure and who might be next to step into the TARDIS. We also give our thoughts on the passing of the legendary Carrie Fisher and John Hurt. Plus rapid fire – featuring Lucifer, Lemony Snicket, Voltron and so much more! Closing featuring Ylvis’s What Does the Fox Say? The post Episode 119 – Capaldi Leaves Who and the Lost Legends appeared first on Transmissions From Atlantis. It’s finally here. Rita and JC give you their thoughts on this year’s biggest movie, Rogue One: A Star Wars Story. Plus the 2016 year in review and they preview the Doctor Who Christmas Special for 2016 while giving you their all-time favorite Who specials. The post Episode 118 – Rogue One appeared first on Transmissions From Atlantis. This week, we lost one of are most dearest friends, Sacha Dzuba, an actor, musician and beloved member of the Atlanta Geek Scene. JC and Rita remember Sacha and give you some glimpses into the great man they knew and loved. We will also be talking Doctor Strange and give you the latest on the rumors of Doctor Who. JC and Rita gives their memories of their dearly departed friend, Sacha Dzuba. Is Capaldi and Mackey leaving after Series 10? Classic series writes for Series 10. The post Episode 117 – Remembering Sacha appeared first on Transmissions From Atlantis. JC and Rita have another great debate – this time BBC’s Sherlock vs. Robert Downey Jr.’s Sherlock Holmes. Also, the duo met David Tennant! Plus they preview Power of the Daleks. All this and Rapid Fire on this latest episode of TFA! The post Episode 116 – The Great Debate – Sherlock TV vs RDJ’S Sherlock Films appeared first on Transmissions From Atlantis. The Walking Dead Season 7 Premiere has…uh…hit and we’re here for you. JC and Rita offer their grief counseling for devastated TWD fans. Also, in rapid fire, we review Miss Peregrine’s Home for Peculiar Children, The Magnificent 7 and in our Doctor Who segment, we review the first episode of the spinoff, Class. JC and Rita meet David Tennant! The post Episode 115 – The Walking Dead Grief Counseling appeared first on Transmissions From Atlantis. It’s debate season and Rita & JC go at it with Star Trek the original series vs. JJ Abrams’ Star Trek movie franchise. Also, we talk Luke Cage, Timeless, Fear the Walking Dead’s finale, Westworld, Doctor Who, Class and more! A Superhero in Doctor Who? The post Episode 114 – The Great Debate – Star Trek TOS vs JJ Abrams’ Star Trek Movie Franchise appeared first on Transmissions From Atlantis. JC and Rita get a preview of the upcoming horror parody, President’s Day, and give you an interview with the Writer/Director/Producer/Star of the film, David Zuckerman. In our Doctor Who segment, we talk Barroman vs. Moffat and the Who spinoff Class. Also in our Rapid Fire segment, we talk Agents of Shield: Ghost Rider, Designated Survivor, Fear the Walking Dead and More! Moffat blocking the Torchwood revival? The post Episode 113 – President’s Day appeared first on Transmissions From Atlantis. Episode 112 - Dragon Con 2016 Review and Flash Gordon's Sam Jones ! JC and Rita give you a full review of all things DragonCon 2016 including an celebrity interview with Flash Gordon himself, Sam Jones. Also, River Song cosplayer extraordinare Rachel Stewart lets us in on her quest to meet Doctor Who’s Alex Kingston. All this and much more on Transmissions From Atlantis! The Digger Bar – a Seekers of the Lost Worlds fangroup! The post Episode 112 – Dragon Con 2016 Review and Flash Gordon’s Sam Jones ! appeared first on Transmissions From Atlantis. JC and Rita bring you their Dragon Con Preview extravaganza with a 2 hour podcasts filled with interviews from DragonCon Media, Track Directors and Guests! Also, in our rapid fire segment we give you our thoughts on Stranger Things, Suicide Squad, Star Trek Beyond and more! The Walking Dead – Was Daryl Lucilled? Was Jenna Coleman a good companion after all? The post Episode 111 – Dragon Con Mega Preview appeared first on Transmissions From Atlantis. JC and Rita are back with their latest Transmissions From Atlantis! This time, we’re talking Netflix’s new original series Voltron – Legendary Defender! Is it a worthy reboot of the classic anime series? We also have exclusive interviews with the voice of the Daleks Nicolas Briggs as well as the eight Doctor Paul McGann and we have other Doctor Who news to talk about. Finally, we have another rapid fire segment where we tackle Game of Thrones, X-men, Finding Dory, Star Trek killing fan films and more. Join us for another thrilling transmission! The post Episode 110 – Voltron Legendary Defender appeared first on Transmissions From Atlantis. Rabid Prince fan JC De La Torre and his lovely wife Rita give you a very special rememberance of the live and music of the musical genius Prince Rogers Nelson. Includes rememberances from Sheila E., Cee-lo (from their appearance on the View) and Lenny Kravitz (from a radio appearance) as well as some emotional rememberances from the Prince Army and Prince Tribute artist, Sir Jac. Closing – Featuring the instrumental cover of Purple Rain by the amazing Neil Zaza. Come see us at Time Gate! The post Transmissions From Atlantis Presents Prince – A Remembrance appeared first on Transmissions From Atlantis. JC and Rita give you an opinion packed episode of Transmissions From Atlantis. Covered in this one – The New Doctor Who Companion, John Barrowman’s potential return to the Whoniverse, Captain America Civil War, Game of Thrones, Prince and so much more! Capaldi thinks this could be his last series. 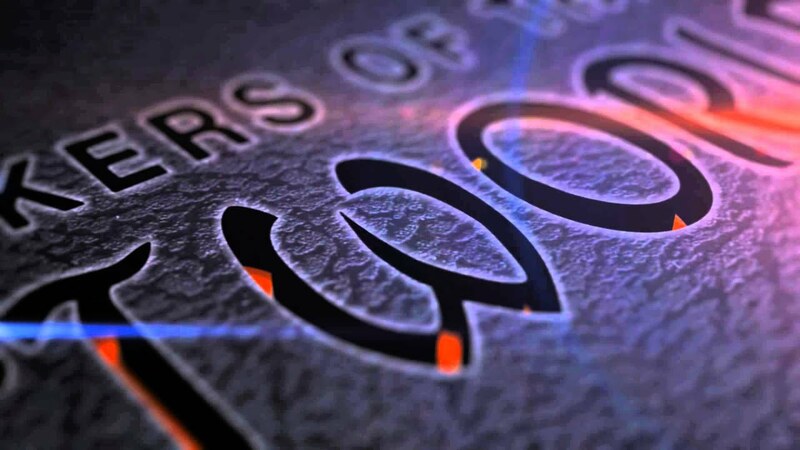 The post Episode 109 – Captain America, Doctor Who, Game of Thrones and More appeared first on Transmissions From Atlantis. JC, Rita and special guest Dr. Scott Viguie break down the debacle that was Batman v Superman. Then, JC and Rita go to Pee Pee Pants City with the season 6 finale of the Walking Dead. Plus Doctor Who and Doctor Geek’s Moment of Science. All this on another fan-friggin-tastic Transmissions From Atlantis. Leave a message on our facebook page! The post Episode 108 – Batman v Superman v The Walking Dead appeared first on Transmissions From Atlantis. JC and Rita go deep in on Deadpool, wrapup the X-Files, talk about their new Project – Seekers of the Lost Worlds. Plus, they discuss the impact of Steven Moffat on Doctor Who. The post Episode 107 – Deadpool and The X-Files appeared first on Transmissions From Atlantis. JC and Rita geek out over the return of the X-Files and Steven Moffat’s departure from Doctor Who. Plus the duo review Series 9 of Doctor Who. JC De La Torre, author of the critically acclaimed novel Ancient Rising, gives us a new fusion of Science Fiction and Magic in Star Mage! Darien Connors discovers he's not from Earth, has strange magical powers, and is the key in an ancient war between two alien races of necromancers. Star Mage offers wizard battles with a side of spaceship warfare, alien worlds, and weird creatures. All six issues of the first series of JC De La Torre's Sci-Fi and Fantasy Epic Star Mage are collected in to one awesome trade paperback. Including the six issues, this collection also features a new Star Mage story written by White Chapel co-writer Martin Dunn with art from Derrick Fish, crests of the Houses of Lambdu Kishpu and concept art by Ray Dillon and Franco Cespedes. The post Episode 106 – Return of the X-files and the Leaving of Moffat appeared first on Transmissions From Atlantis. the new blockbuster movie – the Force Awakens. All this and more on this episode of Transmissions From Atlantis! The post Episode 105 – The Fandom Awakens appeared first on Transmissions From Atlantis. JC and Rita give you their thoughts on Doctor Who’s Two-Part series 9 finale Heaven Sent and Hell Bent. The post Quick Blast 05 – Doctor Who Series 9 Finale appeared first on Transmissions From Atlantis. J.C. and Rita give you their thoughts on the Bond Franchise with Spectre, the fiasco that was Glenn on the Walking Dead and Clara Oswald’s exit in Doctor Who. The post Episode 104 – Glenn Lives, Clara Goes and Spectre Falls appeared first on Transmissions From Atlantis. In this quick blast, JC and Rita review Doctor Who’s Zygon Two Parter! The post Quick Blast 4 – Doctor Who The Zygon Two Parter appeared first on Transmissions From Atlantis.